The Short Version: DeAnna Lorraine takes a big-picture approach to her date coaching by not just focusing on what single men should wear and say to attract women. Services like one-on-one Mock Dates and comprehensive Weekend Bootcamps allow Deanna to get to know her clients on a deeper level — pinpointing their individual strengths and weaknesses and using those to help them become happier, better people in every aspect of life, from their careers to their health and relationships. Growing up in California, DeAnna Lorraine was the only girl in a family of four brothers as well as numerous uncles and male cousins. Not that she’s complaining — she enjoyed being one of the guys and especially getting to be a fly on the wall in their personal lives. 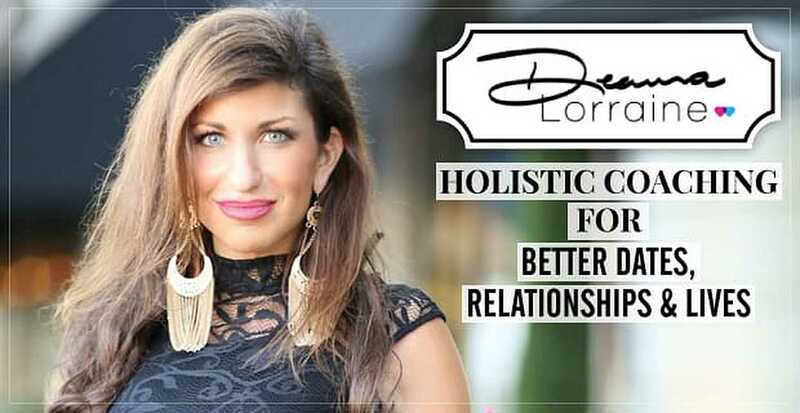 DeAnna Lorraine is a holistic life and love coach. “I intimately understood how guys think, what motivates them, how they talk to girls, how they talk about girls when they’re not around, what attracts them, what their insecurities are, and everything in between,” DeAnna said during a recent call. As she got older, DeAnna became a trusted confidant they would turn to for advice about dating, relationships, and life in general. Not only could she easily relate to them having spent so much time together, but she could also give them a woman’s take on any situation. DeAnna’s parents divorced when she was 10 years old, and while it was a painful and difficult situation to go through, she said it sparked her interest in figuring out what makes a relationship work and what doesn’t. When her mom divorced for the second time when DeAnna was in high school, that interest turned into a calling. DeAnna started helping singles when she was in high school and officially founded her date coaching business when she was 22. Understanding people, especially men, and how to solve their romantic problems came naturally to DeAnna, but she also wanted to back up the advice she gave. So she threw herself into researching what it takes to be a valuable dating coach — reading as many articles and books and talking to as many experts as she could. DeAnna officially launched her business when she was 22, with her initial focus being to help single men become the often-desired alpha male or bad boy. However, she quickly realized how surface-level and short-sighted the pickup-style coaching is, so she expanded her teachings to include deeper fundamentals like building interpersonal relationship skills, creating genuine attraction, having solid core confidence and empowering belief systems, and knowing how to effectively communicate in every situation. DeAnna even obtained numerous additional certifications and degrees in areas like clinical hypnotherapy, NLP (Neuro-Linguistic Programming), ThetaHealing, and psychology (specifically the psychology of success and the psychology of behavior), all of which play an important role in her comprehensive approach. “This also often involves healing deeper issues and eliminating subconscious limiting beliefs that have been lurking in the background since their childhood and sabotaging their relationships with women without even realizing it,” she continued. DeAnna cares deeply about creating bonds with each and every one of her clients, which is why two key services she offers are in person: thorough Mock Dates and “intensive” Weekend Bootcamps. Men have different dating and interpersonal needs, and DeAnna dedicates her time to finding the solution that will work for each person. A fan favorite, Mock Dates allow clients to go through a “simulated” practice date with DeAnna or one of her female assistants over Skype or in person. The client acts and talks just as he normally would on a first blind date. Then after the hour-long “date” is over, DeAnna compiles all of her honest feedback and observations of how the client came across in a full “Date Diagnostic Report,” which includes everything from her very first impression of you, your style and wardrobe, your body language and energy, communication skills, conversation skills and quality, flirting skills, physical appearance, overall attractiveness, and more. This is the “uncensored, brutally honest feedback that guys have always wanted to get from women after their dates, but no one would ever tell you.” And she isn’t shy in telling you what you need to hear in order to grow. DeAnna said Mock Dates are eye-opening and enlightening for the client, as she reveals the blind spots and mistakes guys are making with women, which are the missing pieces of the puzzle as to why they are getting perpetually rejected or not successfully attracting the women they want. Many times, it’s the “subtle nuances” that DeAnna is able to pick up on and articulate, and then help them to shift, that make a big, measurable difference in finally improving the man’s dating and relationship success. After the Mock Dates, DeAnna creates a plan for you to implement the changes needed. And for those clients who want to really accelerate their improvement and develop their skills at a fast rate, she recommends they go through what she calls her most valuable service — Weekend Bootcamps. Fully customized to each client based on their needs and goals, these sessions run from Friday to Monday and are held in Los Angeles, where she’ll give you “hands-on” coaching on how to approach, attract, and successfully interact with women in a variety of dating situations, from bars and coffee shops, to grocery stores and the beach. DeAnna offers a variety of bootcamps that include real-time date coaching in Los Angeles and other cities. DeAnna explained that these on-the-spot trainings help men break out of their shells, shatter old behavior patterns and limiting beliefs that have been getting in their way, overcome approach anxiety and fear of rejection, and, most importantly, learn to successfully approach, attract, and create genuine connections and powerful chemistry with women in their real life. DeAnna started with a simple desire to help her friends and family find love, and now she is one of the most respected and successful dating coaches in the country. Within six months of working with her, 100% of clients are actively dating and 70% are in a relationship. But it’s the stories that DeAnna loves the most. One that stands out in particular is about a guy who seemingly had a lot of cards stacked against him: he struggled with Asperger’s Syndrome, hadn’t had a date in six years, and was extremely self-conscious about his love of video games and anime. He was on the brink of giving up on dating altogether until he found DeAnna. Not only did she help him improve his dating skills, but she also helped him gain the confidence he needed to embrace his true self. DeAnna has made a positive impact on so many people’s lives, and her ultimate goal is to continue expanding her reach, one day at a time. “I want to be able to give coaching to people all over the world and have it be accessible,” she said.